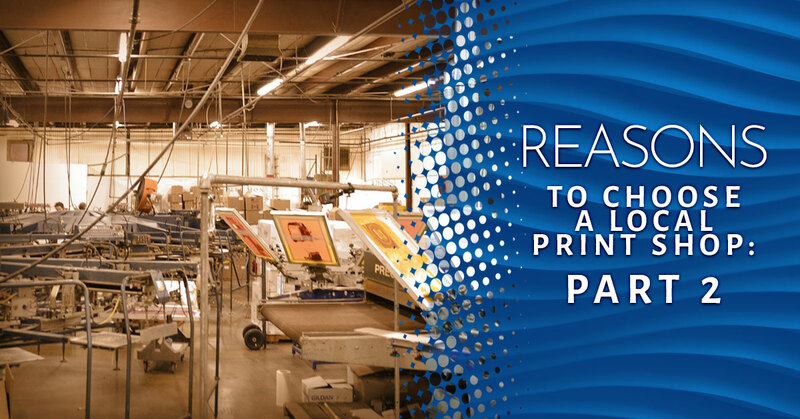 Welcome to part two of our blog series on the reasons to go to your local print shop with all of your custom screen printing needs rather than the big box printing manufacturers. If you want a refresher of the first of our reasons to print locally, check out Part One of our series. If you’re in the Front Range of Colorado and have a printing project, trust your local experts of custom screen printing in Boulder to get the job done. No matter how “out there” your idea might be, if you can think it, we can ink it! At Goodbye Blue Monday, we fully grasp and respect the complex nature of screen printing and know that much of the terminology can seem like a foreign language to those outside of the business. In order to successfully print a product of any sort, it takes the right design characteristics and specifications. When you go to an international online printing company for printed materials, they print exactly what you send and it is rarely checked for any technical errors prior. If you even try to reach out to them on updates on the status of your project, it can be a game of jumping through hoops and ladders. On the other hand, when you partner with your local print shop, they can review or even create a custom screen printing project from scratch for you. You can be advised on the best print size, materials, graphics, file resolution, margins, and everything else that goes into crafting a flawless final printed product. In the end, you will have fewer headaches communicating your needs to a local print shop that is invested in your success and wants to fully understand your desired end results. Your local screen printing company will invest the time and money into building relationships with their clients as many clients are local business owners themselves that become long-term partners. Here in our Boulder print shop, Goodbye Blue Monday, we have been fortunate to build relationships with a multitude of other local small businesses to Boulder and have been providing them with custom screen printed products for years. As you work with a local print shop on your projects, whether for marketing materials, promotional products, screen printed apparel, or anything else, they will get to know your business, make suggestions, and advise you based off the latest printing trends to aid you in creating finished products that are impactful yet economical. Your local screen printing company is owned and operated by fellow community members Would you rather have your money go to some giant corporation in an unknown location or to your hardworking neighbors where your money is kept within your community? As part of the small business network of your town, your locally owned print shops make a huge impact on the employment opportunity and economy. As you use their printing services, rent payments are made, groceries are bought, and other goods and services are purchased from local companies. This is the cycle that makes cities blossom into economically sustainable regions that makes life better for all those who call your town home. Another area where your local print shop beats the big box competition is when it comes to giving back to the community —more specifically, your community. Whether it’s a discount given to local nonprofits, a gift to help promote a local program, or simply sponsoring or participating in a local event, your local print shop is often engaged in the local community and shows its appreciation for your business by giving back. All of the previous factors combine to give you the best quality screen printing services when you shop local, from the experience of going about your project to the finished products. When the reputation and image of your business is on the line, it just makes sense to trust a local printing business who knows exactly where you are coming from. Let your local printing company have your back on all your printing needs so you can focus on what you do best — growing your business. 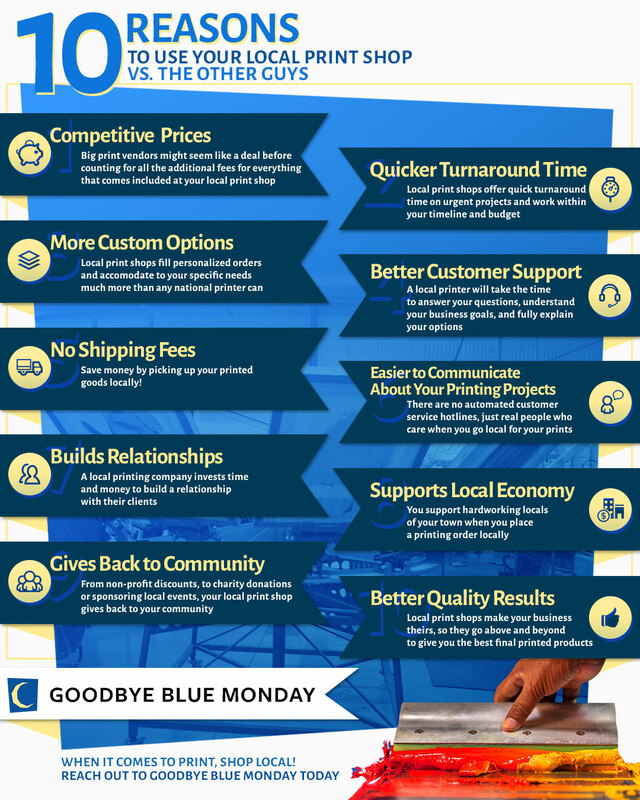 If you’re a small business owner anywhere in the Front Range of Colorado, reach out to your local custom screen printing experts in Boulder for all your needs — Goodbye Blue Monday.